Looks pretty cool. Is there any more information on it? Yeah, sorry. I had to run off to work before I had a chance to add more information. 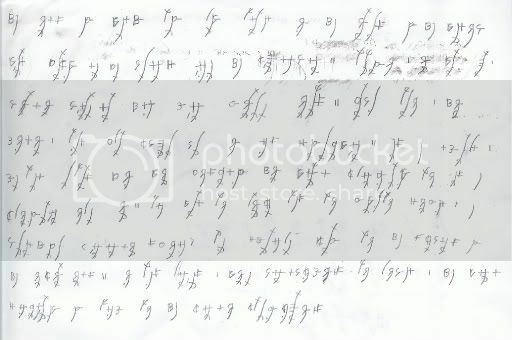 I call it Davin Script or sometimes Nyoisidh. 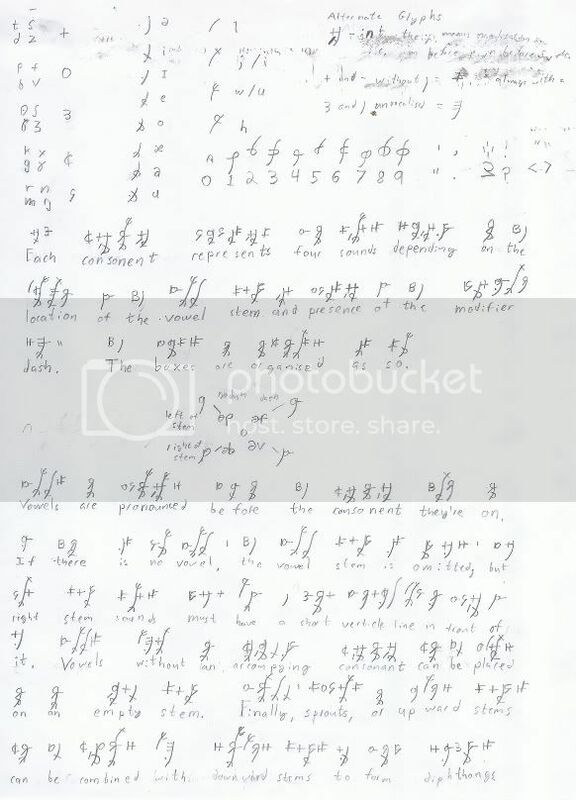 It's an alphasyllabary I believe and read right to left. It was originally designed for a video game I was working on with some friends, but that kind of fizzled out. I wanted it to look like a steam-punkish tengwar, though it's structured more like my other script geingnorsh. I'll put a key up when I have it. The character that looks like "B" and the little dashes make me think of math. (^_^) I can see a bit of tengwar in the form though. I'd like to see more when you have time. I'd say it's a little to complex to be a caveman script. I actually like this one a lot, but of course I'm not a fair judge. It combines the functionality I like with a tad of aestheticism. That looks awesome. I like it! If it's for writing English, you might want to make a few modifications to make it a bit more true to the sounds (my idiolect of English has 11 vowels and allows at least /m n l r\/ as syllable nuclei (maybe more, I'm not sure), among other things), but the basic idea is awesome. Looks a lot like integral calculus. Very interesting. It does remind me of Nushu a bit. Very nice!